Where do I start? I guess where I left off last on my last post. On Thanksgiving day I had about 3 contractions, they were 2-3 hours apart and not painful. That pattern of having one contraction every two or three hours continued on into Friday and also Saturday. Those two days I put myself on semi-bed rest just to be sure, and things did not pick up. On Sunday I called the Mother Baby Unit to confirm my suspicion that they were just Braxton Hicks contractions and that I was fine unless they got more frequent and that I didn’t need to be on bed rest yet. They agreed with me and told me as long as the contractions don’t pick up I was fine and I could go out and do my usual routine. We went out to lunch, and while out for that 15 minutes I had about 4 contractions that were a little uncomfortable but not painful. We went directly home, and as instructed I laid down on my left side and drank some water. The next hour I only had 3 then the next hour only 2 so they were going away. After that I didn’t have any for several hours. At 5 pm I started having one contraction every ten minutes and they were hurting. I decided that I wasn’t going to wait another hour to see if they continue, that I needed to go in. When I got there they did an ultrasound of the girls for their heartbeats and everything looked great, both girls were moving around like crazy and my contractions had slowed way down though they were still slightly hurting. Then the Doctor came in and to examine me and my world came crashing down around me. I was already dilated 4-5 centimeters and Emilyn’s amniotic sac was poking out. They could give me medication and that might stop or slow it down for awhile, but not nearly for long enough to help the babies survive. The age of the possibility of a baby surviving is 24 weeks, and I was three and a half weeks shy, which in a baby’s development is huge. They couldn’t medevac me off island to a place with a higher level of care with the Emilyn’s amniotic sac poking out because the pressure of takeoff could easily rupture it and then have me giving birth mid-air. My only hope was to change my position to take the pressure off of her sac and hope it went back inside, so they admitted me to the hospital, confined me to a bed and moved the bed so that my head was lower than my feet. Even with this my contractions continued and after awhile got more frequent and much stronger. It was official, I was in full blown labor, and my babies were too young to survive, I was losing my little girls and there was nothing I, the Doctors or Nurses could do about it. At 3:25 am our little wiggle worm Emilyn Elisabeth entered this world. I saw her tiny head as they carried her out to clean her up. A few minutes later they brought her back wrapped in a baby blanket with a hat on that was way too big for her little head. She was so tiny and fragile, but she was a fighter. She survived for just over an hour, when they checked for a heartbeat at 4:26 it was gone and she had become an angel in heaven. In that hour that we held her, she moved just a little and turned her head to the left, towards her Mommy and Daddy. Unfortunately in the hour she was with us my labor continued, and our sweet girl and kickboxing champion Hailey Grace entered this world at 4:29 am, shortly after her sister was gone. She was a fighter too and survived for almost two hours. In that two hours we also got to see her move, she tried to take just one breath while we were holding her wrapped in her blankets with her too big hat on, though I’m told they both had tried to breathe at least one breath while being cleaned up. 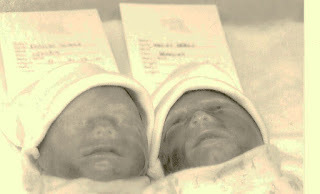 Both girls weighed in at 13 ounces and were 10 7/8 inches long. The hospital let us hold our babies for as long as we needed to say hello, and goodbye. We were able to have them blessed by the hospital chaplain with just us and my nurses in attendance. In our few precious hours with our girls all we could do was hold them, love on them and cry. It seems so wrong that my babies are really gone, they were so healthy. When they were born they were perfectly healthy, they were just born too soon. We have no answer as to why this happened to us, all of my lab tests came back fine, there was no infection or anything. My body just decided that it was time to go into labor even though our little girls weren’t ready. Nothing I could have done differently would have changed anything, nothing could have prevented this because there was no reason for it, just that it was. Saying goodbye to my babies was the hardest thing I have ever done, it just seems so wrong. It was crushing to watch them wheel them both out in their little bassinet. We were able to see them again the next day, they brought them back in tiny caskets, again, so wrong. My babies shouldn’t be in a casket, they should either be still inside me or in a bassinet. Caskets should not have to be made that small. Later that day I was discharged. Walking out of the hospital with empty arms and an empty belly was so hard. All I left with was a memory box for each baby and a folder on grief. My babies were left behind. They were cremated together, they were together inside me for 5 months they needed to be together forever. We have brought them back to Oklahoma for their memorial. We are having it in January 2nd at 2 pm. They will be staying with us though for the time being, until we decide if we want to scatter their ashes, bury them or keep them with us permanently. We have set up a site on the March of Dimes for each girl, the money donated there will help to fund research to fight premature birth. Their sites are posted below. Our only request is that you keep us in your thoughts and prayers through this impossible time.